August | 2010 | Fear the Nerf Bat of Smiting! – Master Hsing Yun, "Describing the Indescribable"
Yesterday evening, hubby and I were watching football when I heard some loud yelling that sounded like it wasn’t part of the game. 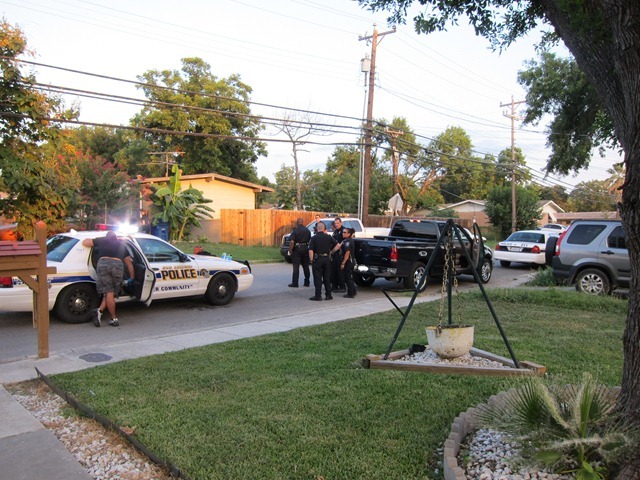 I looked out the window and saw two police officers trying to wrassle a guy out of his truck and into some cuffs – right in front of our house. One officer actually had to jump into the truck and on top of the guy from the passenger side. Our elderly neighbor and her husband got back home at the height of activity. She had a panic attack and had to be walked to her house, which she thought had been broken into. 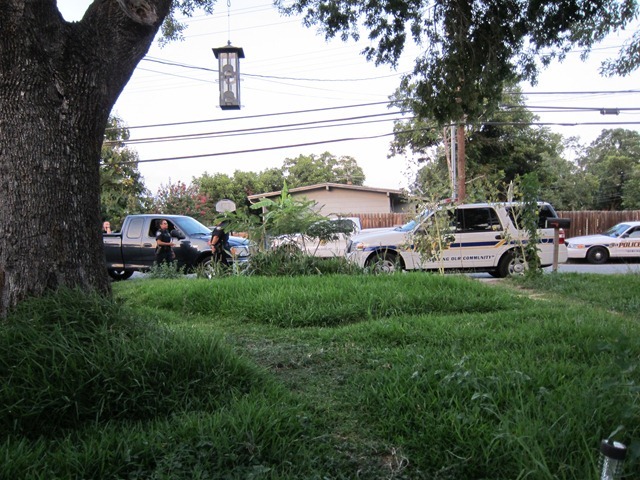 Her daughter, who lives across the street, had the police searching her yard, presumably for a gun or parts of one that the bad guy or his buddy had tossed there. No idea where the other guy is, I only saw one get arrested. In the middle of all this, two of the officers got a call for an incident a few blocks away. Maybe they caught the other guy after all. The bad guy is sitting in the back of the squad car, behind that guy in the jean shorts. Taken from the neighbor’s yard. This neighborhood was quiet and harmless when we moved here in 1999. The noisiest thing here was either a city bus or kids getting out of school. Since then, elderly homeowners have been dying, selling off their homes or taking money from the city to let people live there cheap on Section 8. Unfortunately, the people who rent these places care nothing for us, our property or our safety. They set their dogs on innocent passersby and laugh about it. Most of the people here, especially children, can’t correctly defend themselves and end up being bitten. I’m surprised no one has sued yet. The men sit out in their yards, drink beer and stare at every female daring enough to come out of her house. Even my elderly neighbor says she tries to “dress decent” when she goes outside because their attention makes her so nervous. If they’re driving, they honk and yell at females as they pass by. They carry on gang, family and romantic feuds in full view and earshot of everyone. 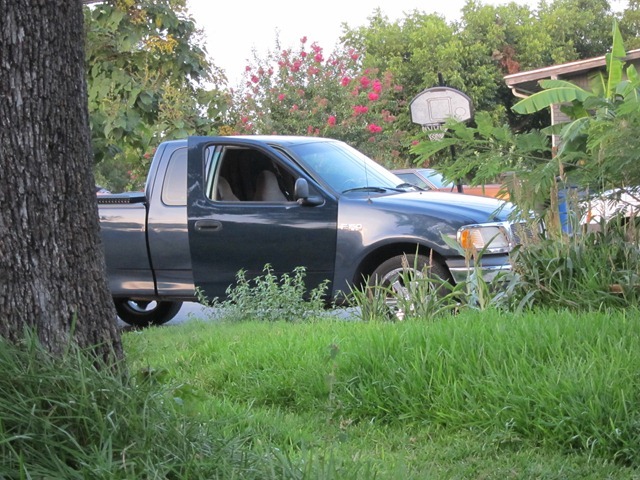 They speed down our street day and night in their noisy cars with bass booming, talking and texting. Our yard has been set on fire twice by firecrackers. Gang graffiti keeps appearing everywhere. Our tires have been slashed at least twice. We hear nearby gunfire at least once a week. This is a nice place, with families and schools and churches and wonderful small businesses who’ve been in this area for decades. I never dreamed I’d be stuck in the middle of a real-life sting operation. Also, when you live in the present, you eliminate fears, worries and doubts. Of course, you might feel a little out of place for a while, as if you weren’t anybody, if for years and years you have been accustomed to making fears, worries and doubts your cherished possessions–more important to you than anything. There are people who just wouldn’t know who they were if you took away from them their fears, worries and doubts. But if you want to be somebody, something, a state of being, you want to live in the eternal now.